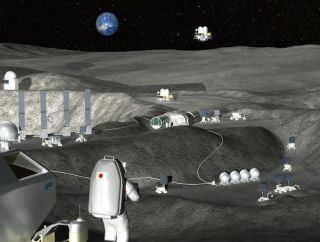 A moon base could be constructed remotely. The project, which has racked up three years of research so far, is a collaboration between the Japan Aerospace Exploration Agency (JAXA), the construction company Kajima Corp., and three Japanese universities: Shibaura Institute of Technology, The University of Electro-Communications and Kyoto University. Recently, the collaboration did an experiment on automated construction at the Kajima Seisho Experiment Site in Odawara (central Japan). A 7-ton autonomous backhoe went through its paces at the site, going through procedures such as driving a specified distance and repeating routine operations, JAXA officials said in a statement. Operations that required more fine handling were performed with a human, by remote control. "[The backhoe] has been modified with onboard survey instruments and an automatic operation control console. The instruments that the tractor and backhoe are installed with autonomously measure [the backhoe's] position and direction ... making it both remotely and automatically operable," JAXA officials said. "The operational process has shown feasibility of the unmanned technologies to build a lunar base," they added. Site preparation work for the module for human habitation. Excavation that meets the required depth. The backhoe is equipped with a suite of technologies to help it work on its own at the moon, which is located about 2 seconds' radio distance away from Earth. In other words, any command sent from Earth would take about 2 seconds to arrive at the moon's surface. (The average distance between the Earth and the moon is about 239,000 miles, or 384,000 kilometers). JAXA used this autonomously operated tractor to practice for someday remotely building a moon base. The backhoe has "operational support," including remote-control functions, that can help compensate for communication delays, JAXA officials said. It also has motion recognition capabilities adaptable to the lunar environment, and the ability to coordinate its work through multiple machines. An autonomously operated backhoe, like this one used in a JAXA test, could someday help construct a moon base. Building a base for humans using remote, autonomous control will require site preparation work, excavation, installing the module, and then shielding it with moon dust (regolith) to protect humans from radiation and possible meteoroids, JAXA officials said. Meteoroids are grain-size or larger space rocks that travel through space at high speeds. If meteoroids strike a structure such as a space station or moon base, there's a risk of the oxygen inside the structure suddenly leaking out into space. This isn't Japan's only futuristic lunar venture. In mid-March, JAXA announced it and vehicle manufacturer Toyota would create a moon rover to transport humans, which could launch by 2029. JAXA hopes to have its astronauts on the moon by 2030, according to Sky News, and its International Space Station partner, the United States, has similar ambitions. Late last month, U.S. Vice President Mike Pence tasked NASA with landing astronauts on the moon by the end of 2024, around the same time the ISS may be retired from government service. NASA is also designing a Lunar Gateway space station for operations in the 2020s. In March, Canada was the first space station partner to commit to joining Gateway; it will construct an autonomous robotic arm called Canadarm3. The year 2019 marks the 50th year since humans first walked on the moon. The actual date is July 20, 1969, when Apollo 11 astronauts Neil Armstrong and Buzz Aldrin spent about 2 hours on foot exploring the moon's Sea of Tranquility.